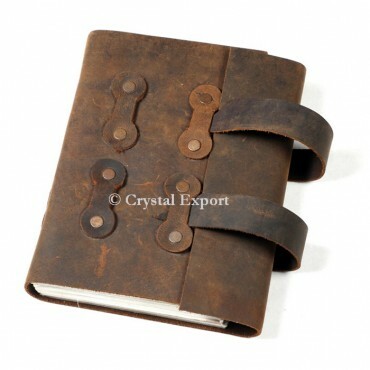 Antique Brown Leather Journals is Soft and Supple Dark Brown Genuine Water Buffalo Leather with a genuine leather fragrance.It has perfect size of 5 by 7 and easy to carry in your bag.It has Numbers of plain sheets plenty to write down any notes, every day plans, unpleasant sketch or thoughts for your book, novel or projectile diary. It includes carefully assembled locking Design which is delightful so not any more hunting down one to begin writing in this flawless diary. Shop Online at Crystal Export.